Another Long Walk: Day 1: Kungsleden Start! 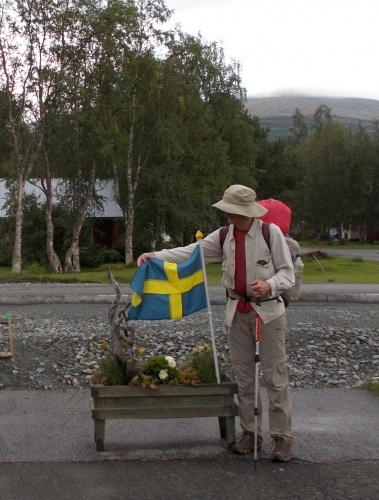 I pose with a Swedish flag outside of our hostel. We woke up in our hostel in Hemavan to a gray, gloomy morning. No rain, however – not yet, at least. To my contentment Ryan let me sleep in until 8:30 which is rather late by his standards (not by mine, though!) Extra sleep put me in a good mood and gave energy needed to tackle our first day hiking the Kungsleden. Before we hit the trail there were some last errands to run. I wanted to take a shower and wash my hair – for the last time in several days to come. We made a brief planning session of our first days on the trail. Today we wanted to hike at least 11 km (7 miles), i.e. as far as Viterskalet, the first mountain hut run by STF, the Swedish Tourist Association. 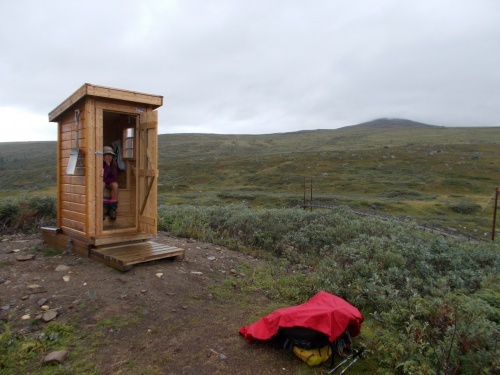 The weather forecast wasn’t very favorable, so if fees for spending a night in the hut weren’t too high, we might opt for the comfort of indoor accommodation. Rain was expected to start late that afternoon and to continue until tomorrow just before noon. We wouldn’t mind having a solid roof above our heads! We estimated that if we hike on average 16 km (10 miles) a day, it would take us five days to reach the first trail town, Ammarnäs. I checked Booking.com for lodging options in Ammarnäs, but they seemed to be rather limited. Luckily, Ammarnäs Wärdshus had hostel rooms available at a reasonable price of 600 SEK for a 2-bed room, so I booked it promptly. Anyways, it was getting late and we were both very anxious to finally start hiking! The Kungsleden Trail doesn’t really start (or end – depending on which direction you hike, southbound or northbound) in Hemavan, but on a hill on the outskirts of the town, so to reach it we needed to hike a couple of kilometers uphill. When hiking towards the beginning of the trail my pack felt so heavy… I don’t know how heavy it was, we never had an opportunity to measure the starting weight of our packs. There was a scale at the Mountain Station about half a kilometer from our hostel in Hemavan, but there was no way we were hiking that extra distance there and back just to weigh our packs. I don’t know about Ryan’s pack but my pack definitely felt heavy. 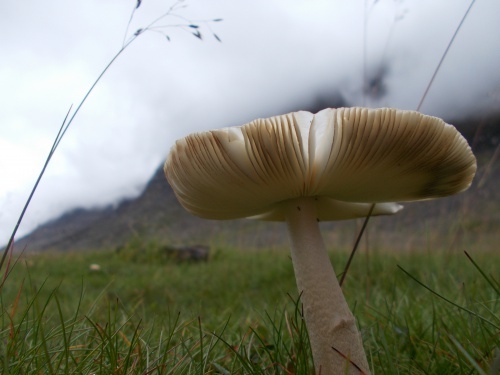 Not only was it filled with an excess of food – much more than what I needed just to reach Ammarnäs, but also my body wasn’t used to carry such weight on my back anymore. Nor was it used to going uphill and downhill. It’s been almost a year since my last trekking trip on Iceland and although I try to go for walks regularly, I live in the Netherlands, which is as flat as a pancake. There is no way I can condition my body in advance for hiking long distances in hilly and mountainous areas with a heavy pack on my back. I do sports to keep fit – fitness, swimming, yoga and that certainly helps my body to keep in a good shape, but I knew it will take me several days before I get stronger and used to the new daily routine. 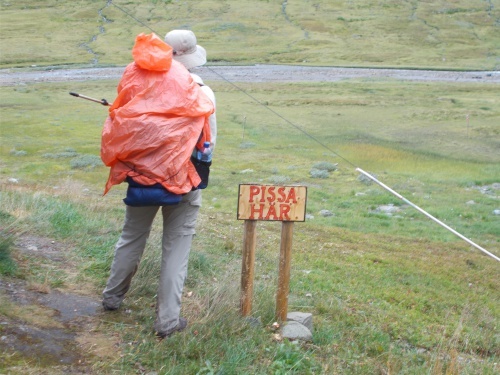 The beginning of the Kungsleden was marked with sort of a gate on which a sign said in large letters: KUNGSLEDEN. We took a photo of us both standing in front of the gate and off we went! I was very excited to set my first steps on the famous King’s Trail. It had been my dream to hike it and I was curious what sort of adventures lay ahead. 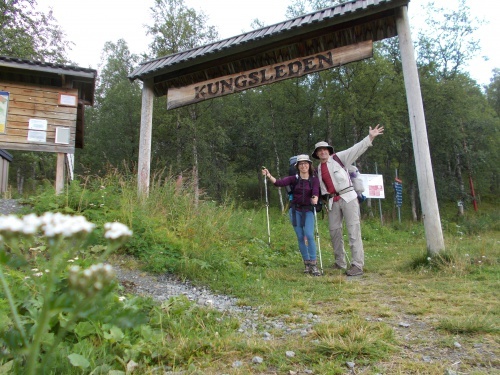 We pose for a photo marking the official start of the Kungsleden Trail. For now the ambiance wasn’t very adventurous. The weather continued to be gray and gloomy. The sky was completely overcast and it was rather dark – even though it was just past noon, lighting-wise it felt like evening. Actually, it felt like evening since the moment I woke up. Strange feeling… The reason for this is probably the fact that so far north (Hemavan in located at 65°50’N, not far below the Arctic Circle) the sun doesn’t rise very high above the horizon. The trail was largely empty. We passed only a few other hikers, including a small group of elderly Swedish ladies heading our way, who were hiking slower than Ryan and I. Of our party of two I was the slower one, Ryan being a speedy-trained-notorious-hiker, so I throughout our hike I would be the one dictating not only the pace at which we were hiking but also the frequency of breaks and the distance covered daily. Just as we were getting above the tree line, we noticed some animals far away of the trail. Reindeer! 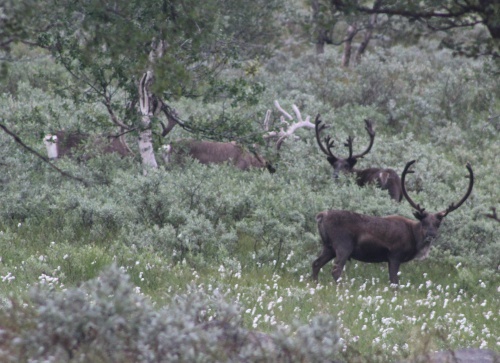 Our first reindeer sighting! Neither Ryan nor I had ever seen reindeer in the wild before, so we were both pretty excited to spot them already on the first day of our hike. Ryan wanted to take photos in case we wouldn’t see any more reindeer later in our hike. He put down his pack, pulled out his fancy, big (and heavy!) camera and bushwhacked off the trail in pursuit of some good shots. While I was busy in the outhouse the rain started. Ryan waterproofed his pack and wrapped it in a bright orange poncho. I donned my red cape which covered both me and my pack, making me look like a hunchback. 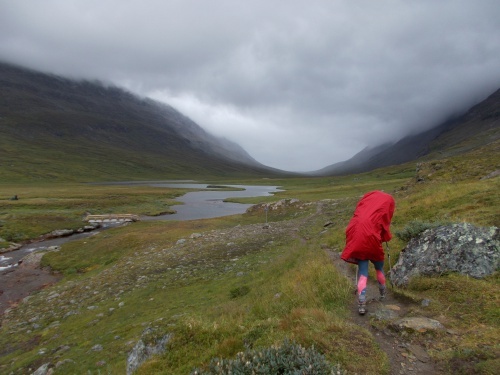 I bought this cape especially for the Kungsleden, knowing that I would be hiking through a rainy land. Last year I got miserably wet when hiking in the highlands of Iceland and promised to myself that next time I travel to a rainy place I will prepare better to protect myself and my gear from that element. It was on Iceland that I saw many people wearing those capes and I kind of like the idea of getting myself one, which I did. Around 5PM we finally reached the Viterskalet hut. We put our packs down and went inside to check it out. It looked quite fancy with its wooden floor and walls, wooden bunk beds and wooden benches and tables. There was a fireplace inside and a few elderly Swedish people sitting around it. They all seemed to be guests in the hut. We didn’t see anyone who would seem to be the caretaker and could inform us about the price of spending a night in the hut. I managed to find the pricelist on the notice board and discovered that it cost €50 per person per night to stay in the hut. Way more than Ryan or I were willing to pay. There was also an option to pitch a tent next to the hut and have access to all its amenities – kitchen, drying room, outhouse and the sauna – for a fee of €25 per person. Still more than we wanted to pay. The option which remained and which we finally chose was to hike further until we find a good place to camp for free. We put our packs back on and continued hiking, keeping our eyes open for a good campsite. Arriving at the Viterskalet hut. Whether Nature hated us or not, the weather was definitely not in our favor that evening and we definitely needed a spot that would shield us from the strong wind if we wanted to have a peaceful night. And such spot was difficult to find. We were hiking along the bottom of the Syterskalet Valley, which acted like a wind tunnel. The terrain was exposed with no trees, no vegetation to shield us from wind, just boulders of various sized scattered around. We tried to find a large boulder which we could camp behind but they all either weren’t quite large enough or the terrain around wasn’t flat. At some point we passed a small group of Swedish hikers setting camp near one of the larger boulders. They came from the north and yelled our way through the wind that it took them quite a while to find a spot more-or-less suitable to camp. Things weren’t looking too good at the moment. We were approaching a pass which marked the end of the Syteskalet Valley when we noticed something on the horizon. It looked like a small structure. 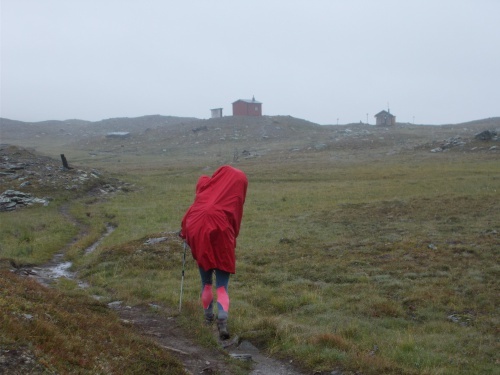 Knowing that in Sweden there are emergency shelters placed in many locations in the mountains we hoped that what we were seeing was one of such shelters. We really, really hoped it would be a shelter where we could escape from the wind and the rain, rest for a while and maybe spend a night if the weather remained bad. What are these mysterious structures in the distance.... we'll find out soon! The walk to the structures seemed to last very long. With every minute my pack seemed heavier and my body ached from carrying it. Finally, we reached the structure, which - to our joy - turned out to really be an emergency shelter. We were saved! There was one person already inside the shelter when we arrived – a hiker from Czech Republic, who was about to finish his Kungsleden thru-hike. 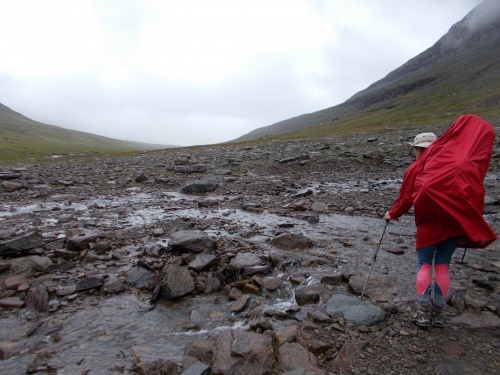 He started in Abisko a mere 15 days before and was hiking 28 km (17 miles) every day. He asked how much time we gave ourselves to complete the trail and upon hearing that we had about a month, he told us that we would get bored. “How many kilometers do you want to hike per day? 10? You will be done within four hours and then what?” We told him we were planning to make short days every now and then when the weather wasn’t favorable and we wanted to have time for detours, zero days, taking photos etc. We weren’t in a rush. We wanted to read books, write in our journals and generally enjoy life in the backcountry, away from everyday worries. We won’t be bored. I must admit that he did not impress me much. I not only didn’t like his “you will be bored” comment, but in general he seemed to be rather uninterested and a bit unfriendly. He would answer when I asked him questions but it was rather difficult to engage him in a conversation. I was hoping he would leave the hut and go camping somewhere, but Ryan kept talking him into spending the night in the shelter with us. “Have you seen the weather outside?” Ryan would ask. “Are you sure you want to camp in it?” And so the Czech decided to stay in the shelter, well protected from strong wind and rain. We all started cooking dinners. The Czech fellow used his gas stove inside the shelter and Ryan went outside to cook on the stairs using his alcohol-fueled soda can stove. I asked Ryan whether he wouldn’t mind boiling some water for me, which I could use to prepare my pouch meal (tonight’s specialty: Portuguese cod with mashed potatoes!) He didn’t mind. Before Ryan started cooking, another person arrived at the shelter. 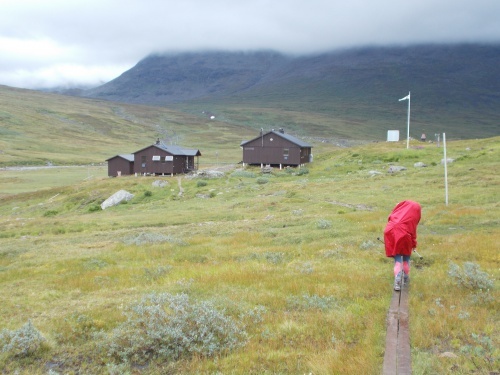 A Swedish women who was on a two month trip around Sweden – on foot, by bike and in a kayak. She stopped in the shelter only briefly, mainly to pee and eat a snack, before continuing her hike. She didn’t seem bothered by the weather at all – she called it “typically Scandinavian and not at all emergency.” What a tough woman! The Swedish woman left, we cooked and ate our dinners, wrote in our journals and slid into our sleeping bags because it was getting a little cold. Ryan might have stayed up a little longer, reading his Kindle, but I can’t tell for sure because I fell asleep almost immediately after putting my head down on my pillow. What you can't see in these photos are the tremendous winds blowing through this valley. I have little doubt they were as strong as a small hurricane! Also note the red cape. If you see photos where Karolina is wearing it (or I'm wearing an orange poncho on my pack), you know it's raining or recently had been raining.